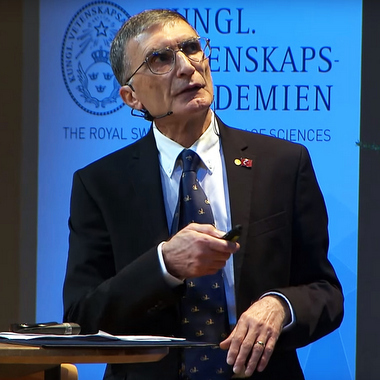 Born in 1946 in Savur-Mardin, Turkey, Aziz Sancar was the seventh of eight children born of illiterate parents who stressed education. Sancar took well to school and to soccer. Despite trying out for Turkey’s under-18 national soccer team, he chose to focus on his studies at Istanbul Medical School from which he graduated in 1969 before practising medicine near his hometown for two years. Sancar then earned a NATO fellowship to study at Johns Hopkins, where Stan Rupert had discovered DNA repair in 1958. By the time Sancar met him, Rupert had moved to the University of Texas at Dallas, where he was trying to purify the repair enzyme photolyase, but he was unable to because the enzyme is not abundant. Sancar joined Rupert as a graduate student in 1974 and worked to increase the amount of the enzyme by cloning the gene that encodes for it. Sancar cloned the gene in 1975, making him the first scientist east of the Rocky Mountains to clone a gene. For this work, Sancar earned his PhD in 1977 and moved on as a postdoc to Yale University, where he invented the maxicell method of identifying proteins and figured out the mechanism of another DNA enzyme system called nucleotide excision repair. Sancar cloned the genes responsible for this kind of DNA repair in bacteria and purified the proteins encoded by these genes. These proteins, acting together, cut out a 41-nanometer stretch of the double helix strand to remove damaged DNA. Sancar returned to his photolyase research in 1982 when he was recruited to UNC by Mary Ellen Jones, PhD, the first female department chair at UNC. Here, he finally purified photolyase and – in collaboration with his wife Gwen Sancar, PhD, and others – showed that the enzyme works as a blue-light-powered machine to repair ultraviolet light-induced DNA damage. At UNC, Sancar continued his work on bacterial light-dependent photolyase and nucleotide excision repair, and worked out the mechanisms of both systems in exquisite detail in bacteria. By the time he earned his full professorship in 1988, he had begun working on nucleotide excision repair in humans. In 1992, he discovered that human nucleotide excision repair is very different from the bacterial system; the damage is removed by cutting out an 88-nanometer stretch of one strand of the double helix in human cells. In subsequent years, he demonstrated that the human excision repair system requires 15 proteins; E. Coli bacteria require only three. He also detailed how these proteins assemble during the repair. In addition to this work, Sancar also discovered one of the four genes that control our biological clock. While investigating whether humans have photolyase, he found that humans do have a similar gene that encodes for a similar protein, but the human protein has no repair activity. He named it cryptochrome and showed that it is a vital component of the molecular clock that sets our daily rhythm. Most recently, he discovered how the four circadian clock proteins interact throughout the 24-hour cycle and what this means for treatment paradigms of various diseases, such as cancer.